Pre-heat your oven to 400° and wash the carrots. Peeling is optional. 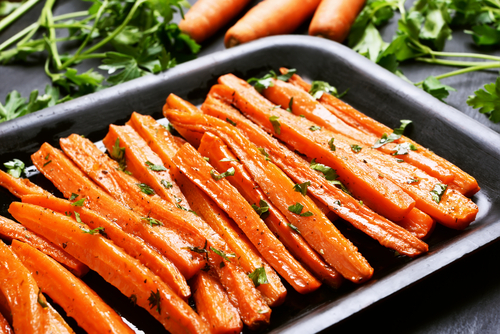 Cut the carrots into fry like slices that are 4 inches long and around ½ inch thick. Once the carrot slices are complete, place them into a bowl, and drizzle with olive oil evenly. Add the pepper, garlic powder, sea salt, and thyme. Place the carrots on a cookie sheet lined with parchment paper. Make sure they are evenly spread out. Bake for 25-35 minutes, and check them halfway to flip the carrots to the other side for optimal cooking. The carrots should be easy to pierce and browning. Remove, cool, and enjoy! I 100% agree. These are our go to snack and veggie. Even my kids can make them in the toaster oven. These were a big hit for the whole family. Very tasty. I love the sweetness of the carrots with the salt and pepper. I only used half a pound of carrots, but kept other ingredients the same and they were a little dry after baking. I may add a little more olive oil next time. Mmmm. Tried these tonight and they were sooo good. My family really enjoyed them too. Will definitely be adding this to my recipe book.